The facilities are top-notch. From condiment tables, cleanliness, artist murals, and precise sound systems, to the easy-going crowds made it an enjoyable experience. I was dreading Lollapalooza-like mayhem, but the polo grounds were a delight. Did I just mention the facilities as the most memorable part of the show? I think I did. Lackluster bill. 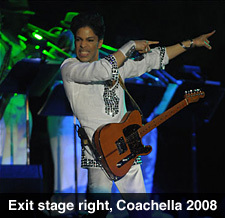 Prince as the headliner of an indie and electronic festival? Kraftwerk look like they surf the internet during a live performance. With exception to The Man Machine, We Are The Robots, and Music Non Stop, the set was forgettable at best with forced applause. Cool lighting, but boring enough to make me feel like I was in a bad German nightmare at times. Fatboy Slim spun other people’s house music for most of the night instead of playing his own infectious big beat grooves. Disappointing. Jack Johnson is boring live, unless he’s playing as you sunbath on a beach in Hawaii. Boys Noize was a pretty compelling (but aggressive) techno act. I think I’ll check them out. Cold War Kids were pretty cool, but not standout. Vampire Weekend aren’t nearly as good live as they are in the studio. MGMT is so overrated, both their debut album and live performance. Meh. Portishead has sadly gone from the pioneers of gritty trip hop to… uh, let’s play sad songs with absolutely no edge whatsoever. That makes me a sad panda. I was hoping for more of this. Minus The Bear was more indie live than electronic, which I didn’t like. Death Cab for Cuttie was (surprisingly) the best band of the show. The crowed absorbed the band’s on-stage energy, as did I.
Crappy bands were in abundance (cont.). Excellent format, location, and amenities (cont. ), just lacking in live music. Note: Attendee mileage may vary. I didn’t stay for Prince’s two hour set. It was impossible to catch all of my favorite acts and/or notable bands due to time constraints. I didn’t see any Sunday performances (sadly missing Justice as a result). I don’t experiment with fleeting recreational drugs of any kind. Bad luck – you seem to have caught a lot of the worst performances. I agree 100% with you about Fatboy, Kraftwerk, MGMT and Portishead (whose music was beautiful in its way but horribly wrong for a festival). Prince seemed to have made no effort to tailor his glitzy sanitized Vegas show for a more indie audience. Jack Johnson will always be dull, but was a nice relaxation if you had seen some decent dance acts in Sahara, which as far as I was concerned was the best place to be for much of the 3 days (especially Sunday which we thought was the best day. Holy crap – I refuse to use asterisks – and Does it offend you, yeah? were pretty good in the Gobi on Sunday, and the whole session from Modeselektor, through Simian Mobile Disco and Chromeo – who by the way did the set that Prince should have done – short, funky and punchy – to Justice, had stoned and clearheaded alike jumping up and down. Did you see Hot Chip, Pendulum or Aphex Twin in there? or Flogging Molly in the outdoor theatre? What about Bonde do Role – really high energy Brazilian hiphop. The only bands we thought really did it on the main stage were the Raconteurs and of course the awesome Gogol Bordello,although we heard good things about Cafe Tacuba. Sharon Jones did a passable impression of a female James Brown. BTW if you don’t experiment with fleeting recreational drugs, what do you do – long-lasting ones? We met a girl who was saying that K made her feel existential – an existential doped horse was a new one on me. I definitely would have liked to see Death Cab. I’ve been listening to their Plans album off and on for the past few weeks, and can’t seem to get enough. You need to never go to Coachella ever again. Keep listening to jack johnson, fag.